Tiger Ears » Blog Archive » Live action super hero! 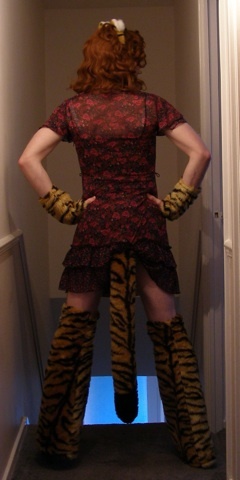 It has already been established that I am a furry and I have mentioned having made a rudimentary tiger outfit. When I started playing City of Heroes my natural instinct was to create a super hero catwoman—but not a 'Catwoman' super hero—and Sue Purr was born. My penchant for tiger-style patterns is reflected in the City of Heroes character creation tool. It's not so much that the tiger is my favourite big cat but more that their fur pattern is suitably distinctive that it is immediately recognisable as being that of a tiger, unlike a panther or lion, for example. It is thus no surprise that the City of Heroes character creation tool has a tiger pattern available. The tiger outfit of Sue Purr is similar to the little tiger outfit I made for myself. They were both created separately, with my outfit inspired by something I saw on the internet and Sue Purr's from the options available in the character creation tool, but it shouldn't be a surprise that one tiger outfit closely matches the other. The only part of my outfit I didn't make myself is the ears, which is actually a hairband bought from London Zoo, although I have a long-standing plan to make my own pair. As I quite like dressing up occasionally, I thought I'd share how my outfit compares to the City of Heroes character. Hi PJ, I've bookmarked your site here so please post more about your cheese dreams. I've been eating lots of cheese but the dreams have been pretty boring. I dreamt that Zach Braff, of Scrubs fame, replaced Richard Hammond on Top Gear, but that's about it.